What’s that you say? Am I eating breakfast again? Well yes, I guess I technically am. But it’s lunch. I was actually really craving eggs for breakfast this morning, but couldn’t manage to have anything with any sort of heat to it. On Friday evening, I was lucky enough to get my hands on another batch of Kathryn’s chickens’ eggs and have been dying to have some ever since. They’re seriously just so good. 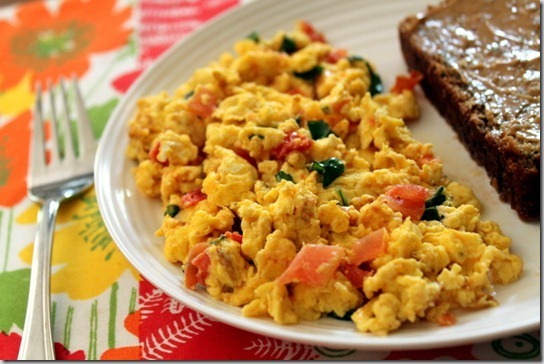 So for lunch, I decided to make myself a scramble with 2 whole eggs, diced tomatoes, fresh basil, and provolone cheese. 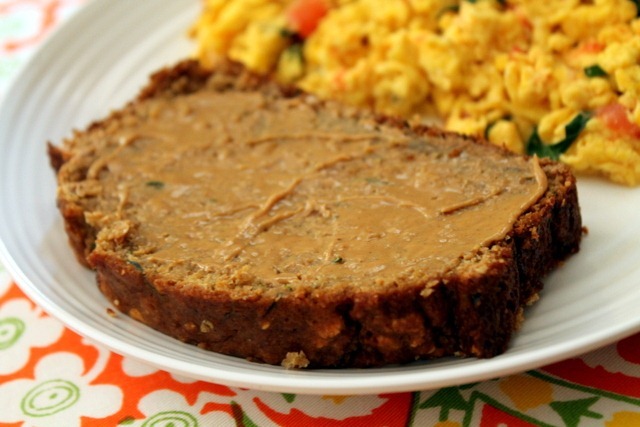 On the side, I had another piece of Zucchini Oatmeal Bread topped with peanut butter. I’ll tell ya…I’m totally lovin’ on this stuff. And now I’m passing it on to all of you! 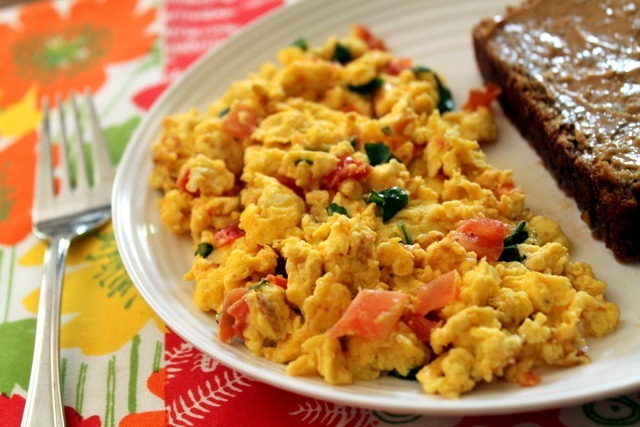 Moist and delicious, this recipe will be perfect for breakfast or a scrumptious morning snack. Or, heck, any time of day! Preheat oven to 350 degrees F. Spray a 9x5 inch loaf pan with non-stick cooking spray. Combine the first 8 ingredients in a bowl and set aside. Combine the eggs, applesauce, and vanilla in a bowl and mix until blended. Stir in the zucchini. Slowly add the dry ingredients just until moistened. Pour the batter into loaf pan. Bake for about 1 hour or until a tooth pick comes out clean. Cool in pan for 10-20 minutes before removing from pan. Enjoy! So far, it’s been great topped with honey butter, cinnamon cream cheese, and peanut butter. « Are My Plants Done? Right? I always want the heel pieces. I've started baking my bread recipes in a 9x13" pan so that I get more crispy edges! I was hoping you would post this recipe!!! Sounds delicious! 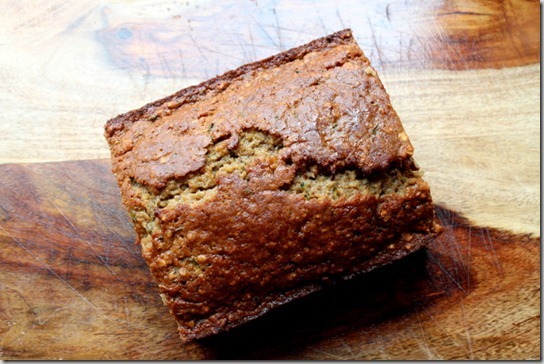 Love this recipe- bookmarked for when the baking urge hits next! It's funny because I love the heads of freshly made bread yet always avoid those slices in store-bought loaves. I have a quick question on your recipe. I just ran out of whole wheat flour but do have regular... would the measurements be the same? Also do you have to use "quick" oats? can I use the old fashioned oats? Looks delicious!! I will probably use white whole wheat for both cups... That's about the only flour I use anymore. Glad to know that we can use ol fashion oats - much healthier. Thanks so much for a recipe that uses applesauce! Can't wait to try this! Looks delicous and healthy! 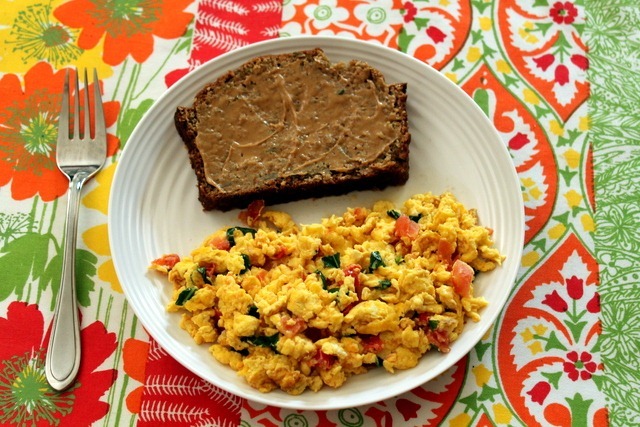 I bet it would be great with maple almond butter, yum! 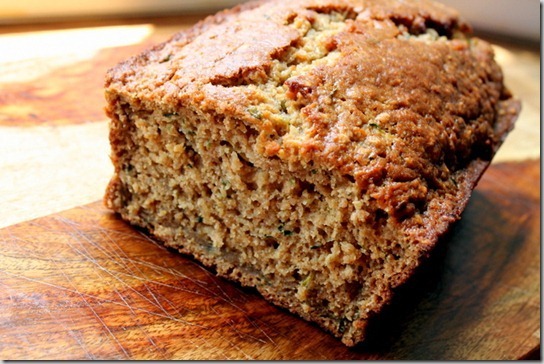 That bread sounds like a winner- I love how moist zucchini bread is!!! Yummmm! It makes me laugh at my teenager self when the thought of zucchini would make me dry heave and now I am drooling at a picture of zucchini bread. So glad my taste buds changed to appreciate things like this! 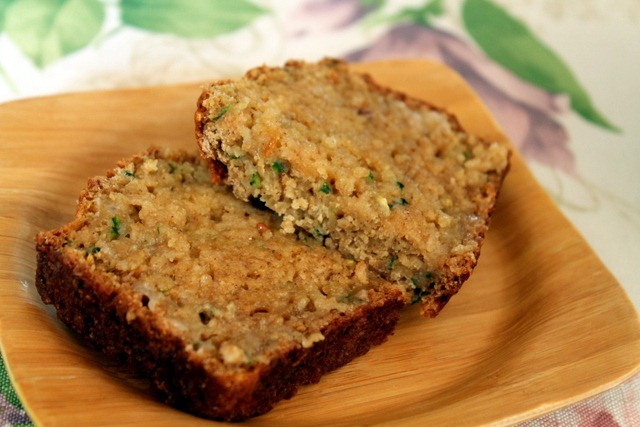 Believe it or not, I've never tried zucchini bread before! I may have to add this to my recipe rotation. And I'll definitely eat the ends first!! That bread sounds phenomenal (and not too difficult to make?). I'm definitely going to have to try it out! Ahh that bread sounds amazing!! I'm not sure I'd be able to control myself around it haha. Hope you're having a great day Courtney! Well, I'm thinking I'm especially lucky that I just bought 3 huge zucchini, my neighbour brought me over 4 home grown zucchinis, and my mom gave me another 3. I am set. This looks wonderful! I love breakfast for lunch! Or dinner! That bread looks amazing, I'd probably finish the loaf in a day or so! ahhh why are the ends soooo goodd!!! I love your love for the ends. Please tell me you do the same thing with brownie edges. I think we're meant to be. I just got zucchini, yellow squash and cucumbers from my garden and they were huge! Nothing like real, fresh, home-grown food. 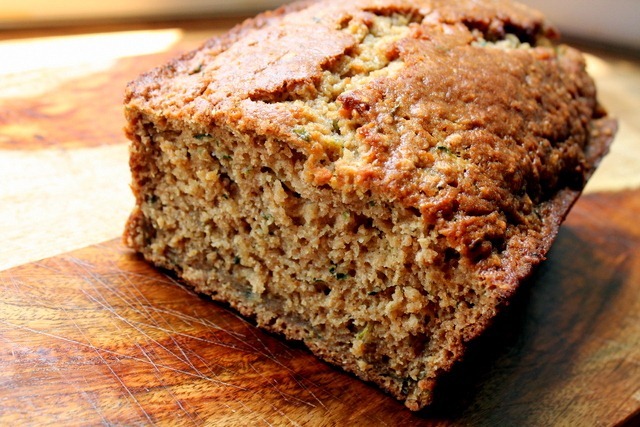 That zucchini bread is at the top of my "things to bake" list. It looks delish!! sounds awesome! i love oats in bread!! I made this yesterday using my giant zucchinisfrom our garden and it is delicious!!! Every recipe I have tried from your site so far has not disappointed. My husband is seriously in love with the buffalo chicken pasta. Thanks for sharing!!! 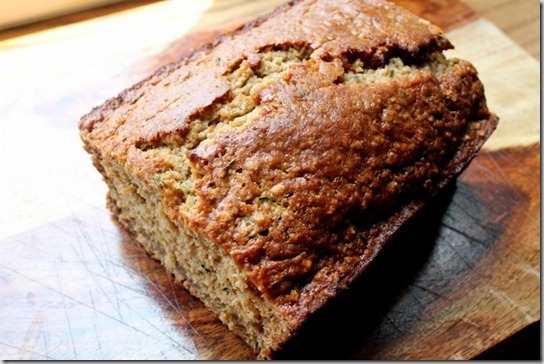 I really love this zucchini oatmeal bread. I cab eat as many as I can when I am hungry so I make sure that I can eat this bread sometime. http://www.delightedmomma.com/2012/05/flourless-zucchini-brownies.html You must make these! Made them for girls night and they rock. I added extra dk choc chips and added some cocoa and subbed agave for honey. And underbaked. Yum! And "healthy" enough for breakfast if they make it that long!